Bus from Kota Bharu to Kuantan is the most important bus service to connect people between the state capital of Kelantan and Pahang. Because there is no direct train and flight service for this route, bus become the most preferred choice of transportation to travel back and forth between Kota Bharu and Kuantan. Transnasional and Perdana Express are the two reputable bus operators providing bus from Kota Bharu to Kuantan. Transnasional as the government bus is the dominant player in this route service by having up to 10-12 daily trips from Kota Bharu to Kuantan while Perdana Express only provides 4 daily trips. 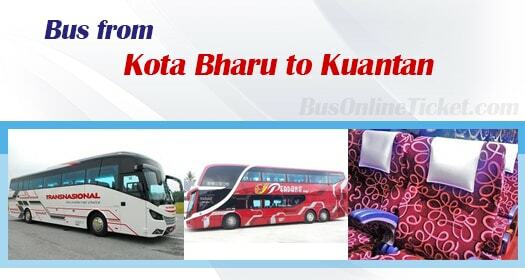 The first bus service from Kota Bharu to Kuantan starts in the early morning at 8:30am. The last bus leaves the bus terminal at night 11:00pm. Bus service from Kota Bharu to Kuantan usually run less frequently during afternoon with only timing available at 2:00pm. Duration required for bus from Kota Bharu to Kuantan usually takes about 6.5 hours, depending on the traffic and weather condition. The adult bus fare for bus from Kota Bharu to Kuantan is charged in a range of RM 34.60 to RM 35.00. Government bus Transnasional does offer child fare at RM 26.00. The boarding point in Kota Bharu is located at Kota Bharu Bus Terminal. The arrival point in Kuantan is located at Kuantan Sentral Bus Terminal. One washroom break will be given during the journey. Passengers could request for extra break from the driver during the journey. Booking your bus from Kota Bharu to Kuantan with the reliable site BusOnlineTicket.com is the best way to save you a lot of hassle. BusOnlineTicket.com is a one-stop online ticketing portal which is connected with most of the bus operators in Malaysia in order to bring great convenience to the passengers.